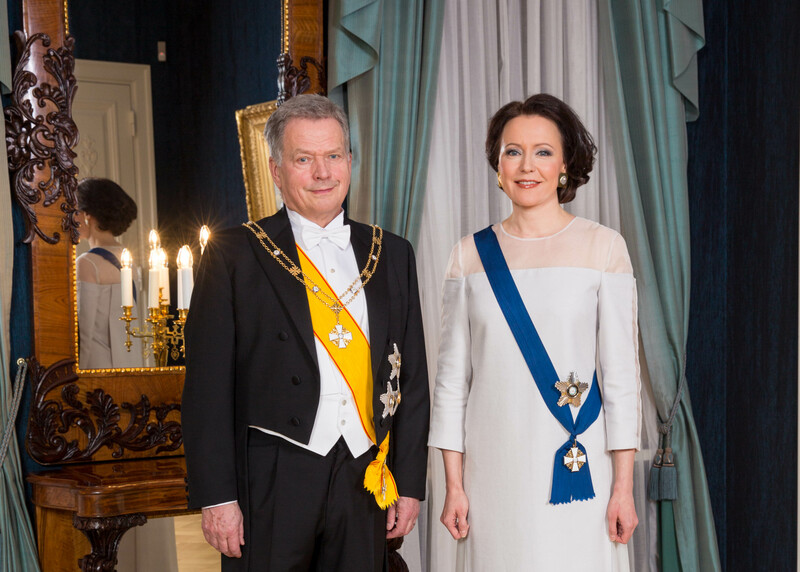 The President of the Republic Sauli Niinistö hosted Finland’s Independence Day reception together with his spouse Mrs Jenni Haukio on 6 December 2018. The theme of the reception, our shared environment, was prominent in, for example, the guests, music, foods and drinks served and in the decorations used. A total of 1,700 people, who are distinguished in various ways and in different fields, had been invited to attend the reception. Invited guests included, in particular, Finns who have made both small and large efforts to promote sustainability and the environment. Finnish war veterans and members of the Lotta Svärd were guests of honour. They arrived first to greet the presidential couple to the accompaniment of the Jäger March by Sibelius playing in the background. The Guards Band performed while the presidential couple greeted their guests at the Independence Day reception as well as during the early evening in the Hall of State. The band had selected the music in line with tradition and the reception’s environment theme. The presidential couple danced the first waltz to Valse Lente composed by Oskar Merikanto. This year marks the 150th anniversary of Merikanto’s birth. The Guards Combo with its soloists Jennie Storbacka and Mikael Saari entertained guests on the Hall of State’s dance floor with music that is nature themed. Additionally, the Combo’s dance music featured composer-lyricist Junnu Vainio as this year is the 80th anniversary of his birth. The Philomela Choir and YL Male Voice Choir performed at the coffee event for veterans and lottas. Sibis Jazz Youngsters, the Sibelius Academy Youth Academy’s student jazz band played in the Third Floor’s Salon. The catering for the 2018 presidential Independence Day reception consisted of foods and drinks made predominantly from domestic raw materials. In particular organic products, local food and other products that cause as little load to the environment as possible had been selected to be served at the reception. The environmentally friendly theme had also been taken into consideration in the drinks served at the reception. For example, the reception’s traditional punch was prepared this year nearly entirely from organic products and the apple juice served had been made from apples grown at the President’s summer residence Kultaranta. Collaboration with educational institutions also continued in 2018 as has been tradition. Twenty-eight students from Salpaus Further Education in Lahti assisted in the kitchen and with serving. The main colours used for decorations at the presidential Independence Day reception were white and green. The flowers for the reception included primarily lilies, roses and tulips. Other plants included blue cornflowers and hydrangeas as well as many other natural materials gathered from the grounds of Kultaranta. Favoured natural materials included fresh sprigs, branches, pine cones, ferns, typha, cow parsley and various types of grasses. With the exception of hydrangea, all the flowers used in decorating the presidential palace were from Finnish gardens that utilise renewable energy sources.